Home Fitness and Wellness How Many Calories in an Apple? Apple is one of the most common fruits in the world. There are over 7500 varieties. Apple, Malus Domestica, is a deciduous tree of the rose family (Rosaceae). According to the legend, the apple came from the paradise and although it caused many problems there, it still has the status of paradise fruit. Apples are a symbol of eternal youth. Positive properties of apples have been known since ancient times, and historical information about them, since the year 500 BC. Modern medicine believes that apple is one of the healthiest foodstuffs. Apple does not have high energy value but it is rich in minerals, vitamins, and other beneficial ingredients. So it is a great diet food. In concrete terms, a number of calories in an apple is associated with its size: a small apple (2 ¾ inch diameter) contains 77 calories, a medium-sized apple (3 inches in diameter ) 95 calories, a large apple (3 ¼ inches in diameter) 116 calories. Apples should be eaten before a meal or a few hours after because it awakens the appetite with its high percentage of water in which the different ingredients are dissolved. Just one apple a day provides a good intake of vitamin C, A, E, B1, B2, B6, beta-carotene, potassium, calcium, phosphorus, magnesium, and iron. Of these minerals has the highest potassium, and this allows a better cleaning of the body of the harmful substances and a better elimination of the excess water. Apples are rich in antioxidants, fibers, and flavonoids. The most useful components of apples are in the crust, so it is a big mistake to peel an apple. 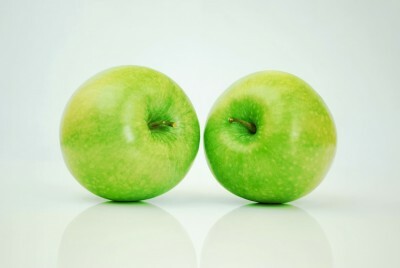 Just two apples a week are sufficient to reduce the risk of diabetes. Apples also provide protection against cardiovascular diseases and improve blood pressure, blood lipid and the antioxidants in the blood. In addition, reduce the possibility of stroke by as much as 50%. For teeth, an apple has the same effect as brushing teeth, as it helps remove food deposits between the teeth and stimulates gums and stimulates the secretion of saliva, which washes away plaque. Apples are excellent for the prevention of several types of cancer, including cancers of the mouth, intestine, breast, esophagus, kidney, prostate and ovarian cancers. Apple juice positively affects brain health, including the prevention mental deterioration caused by aging. To all who struggle with weight loss apples are the best allies, since accelerates metabolism. Phytonutrients in an apple occur in the form of polyphenolic compounds that protect the body from the damaging effects of free radicals. As well as reducing the risk of getting many diseases, they speed up the metabolism, clean the intestines, reduce cholesterol and removes harmful substances from the body. Recent research has demonstrated how much apple polyphenols positively affect the regulation of the blood sugar. One of the most famous flavonoids present in apples, quercetin, whose impact on the health has a wide range, can affect certain enzymes that perform the disintegration of complex carbohydrates into simple sugars. Most polyphenols in an apple have antioxidant functions, so it is not surprising the enormous amount of a research that has been done on an antioxidant activity of apples on the human organism. Next articleAre Monster Energy Drinks Bad for You?